Blowing Green Mountain sits along the divide between the Passaic and Delaware watersheds. Its north and east slopes form some of the highest parts of the basin of the Rockaway River, a Passaic tributary. The mountain’s south slopes drain directly into the celebrated Lake Hopatcong, the headwaters of the Musconetcong River, which flows southwest into the Delaware. Roughly a mile east of the mountain, near the Morris County highpoint, is the triple divide between the Hudson, Delaware and Passaic watersheds. The Walkill has its headwaters just east of here, at Lake Mohawk. It flows north into New York State, past the Schawangunk Mountains, and joins Rondout Creek, a Catskill stream, which empties into the Hudson 80 miles upstream from the Battery. Barely nine miles to the south is the headwaters of the Lammington River, a Raritan tributary. Of more local appeal, just a few miles north is the divide between two major Passaic tributaries: the Rockaway and the Pequannock. Their courses are covered in detail in the Passaic River article. These interlocking shapes, a fulcrum point. Just as an epiphany can bring together distinct memories, ideas and aspects of life into a single moment, a triple divide anchors together vast regions in a single geographic spot. Trenton, Philadelphia and Wilmington stretch out in one direction. Paterson and Newark and the dense North Jersey core are in another. Rotate again and there is southeastern New York and, 80 miles down the mighty Hudson, New York City. 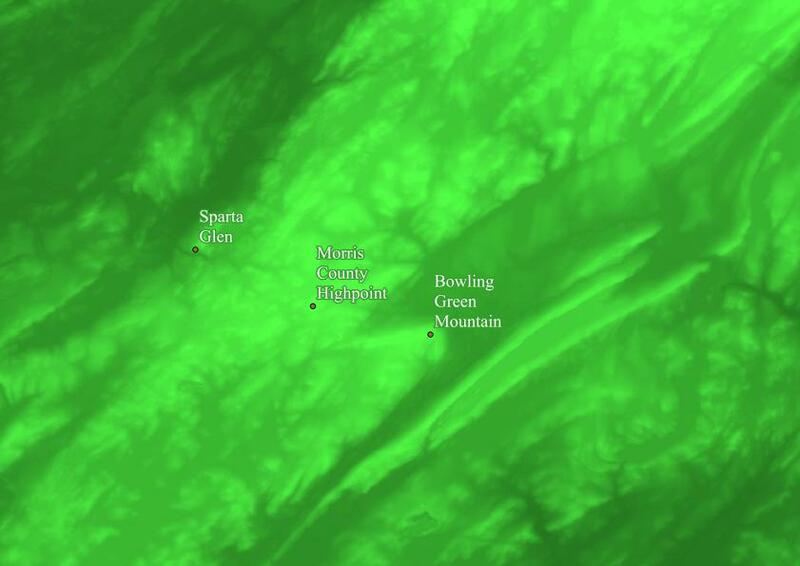 Bowling Green Mountain has a distinctive wedge shape on a map. Close up, it is an east-west running ridge of reddish purple sandstone and conglomerate that drops off steeply to the north and hardly at all to the south. North and east of the mountain is a valley containing the town of Jefferson, NJ, with thicker glacial soils. South and west is the rocky forested upland terrain of the NJ Highlands. 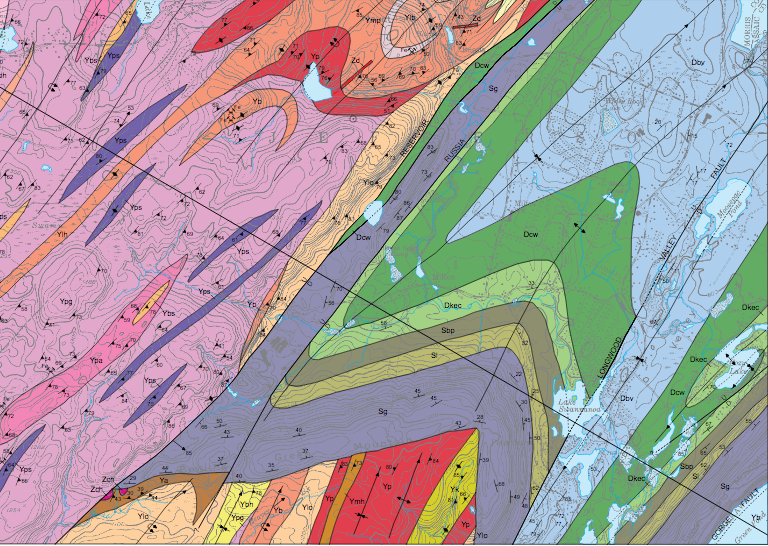 Bedrock geology explains the shape of the mountain and surroundings. A plunging anticline, with a ridge-forming layer of Silurian conglomerate and arkose sandstone, forms the wedge shape. This structure is part of the Green Pond Outlier, a long narrow band of sedimentary layers, of Silurian and Devonian age,that stretches from the SW to the NE right across the middle of the NJ Highlands. Normally the Green Pond region consists of parallel SE-NW ridges and valleys such as Beaufort Mountain and Green Pond Mountain, but here Bowling Green Mountain’s E-W ridge stands out against the grain. The broad, low-relief highlands to the north and west of the mountain, containing the Morris County high point, are more typical of the NJ Highlands. They’re underlain by igneous and metamorphic rocks of precambrian age. A major fault, the Reservoir fault, separates them from Bowling Green mountain. The ridge is mostly covered in a mixed oak forest. In places on the slopes there is thick Mountain Laurel, but elsewhere the forest is open, or has low bush blueberries in the understory. In a small depression west of the ridge, right on the Reservoir fault, are a couple of swamps, forming the headwaters of a small stream. These contain a greater variety of tree species, with red maple, tulip poplar, and beech common. In the thick of these swamps are some beautiful huge rhododendrons. The slopes immediately around them are densely choked with mountain laurel, giving the area a jungle feeling. On the ridge is a fire tower, offering a sweeping view. You can see Lake Hopatcong, and past it hills and mountains stretching to the south, probably I now realize including Jenny Jump mountain, where I’ve never been. To the west you can see Culver’s Gap in Kitatinny Ridge. To the north you can see the ridges and valleys of the Green Pond region, and the mysterious wilderness of the Newark Watershed and Wawayanda State Park, rising gradually up from the Pequannock valley. This is an interesting area that promises strange dark revelations. To the east, you can see Manhattan in the distance.